Traditionally, people’s ideas about Buddhist temples are gray-tiled buildings tucked away in the mountains. Temple doors are always closed, shutting out the sound and fury of the outside world. Within the tall red walls, monks’ lives are made up of chanting sutras and meditation, in addition to carrying out daily duties. Life was that way at the Shaolin temple two decades back. But it has taken quite a different turn now. Pictures below shows its commercial route. In 1989, the Shaolin monks formed a martial group, performed martial arts for the first time in Hainan Province. Since then, the monk martial group has performed thousands of time at home and abroad and find a road of “martial arts economy”. 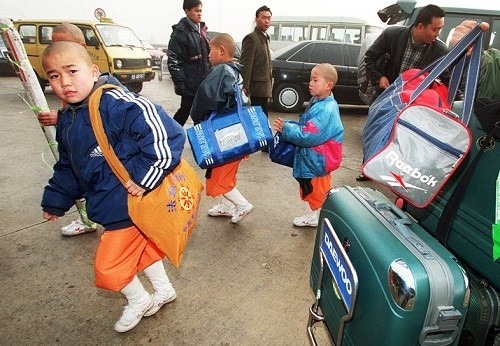 The picture shows the December 18, 1997, Beijing Capital Airport, the Shaolin monk group were leaving from Malaysia for a charity performance. June 3, 2004, Shaolin temple opened the first overseas Shaolin Wushu Culture Centre. in Vienna, Austria. Up to 2010, the Shaolin Temple has established dozens of similar centers in the United States, Britain, Germany, Australia, Italy and other countries. 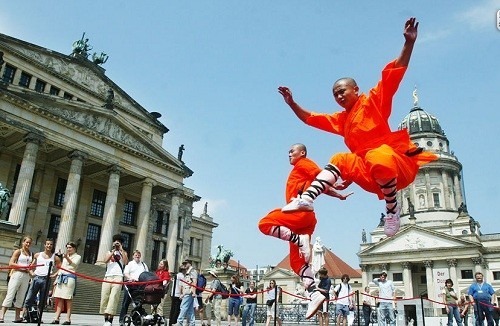 More than thirty Wushu monks live overseas to teach Shaolin martial arts. The picture shows June 3, 2004, monks were giving open-air performances in Vienna. 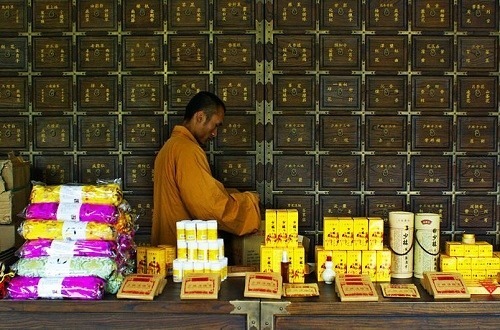 In 1998, Shaolin Temple set up “Shaolin Industrial Development Co., Ltd.”, Its main business is Shaolin Cake, Shaolin Zen Tea. The Temple also registered nearly 100 domestic trademarks. 2007, a hospital called “Shaolin Pharmacy” opened. Then “Shaolin Pharmacy” applied trademarks for instant noodles, coffee and other commodities with this logo, but the State Trademark Review and Adjudication Board thought it was “easy to be mistaken with medicinal function by consumers “, so the trademark application be rejected. 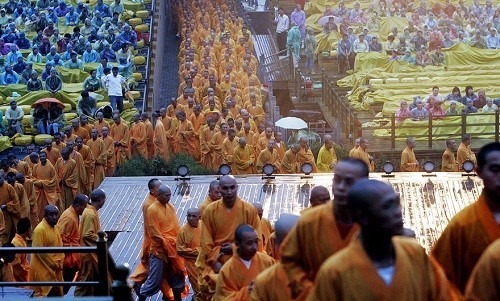 In 2006, the Shaolin Temple undertook a series of large-scale activities. July, the beauties from Miss Tourism International contest were arranged to visit the Shaolin Temple. 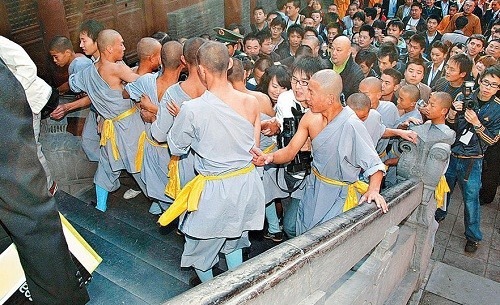 Henan TV launched blessing meeting for 999 new couples in Shaolin Temple. 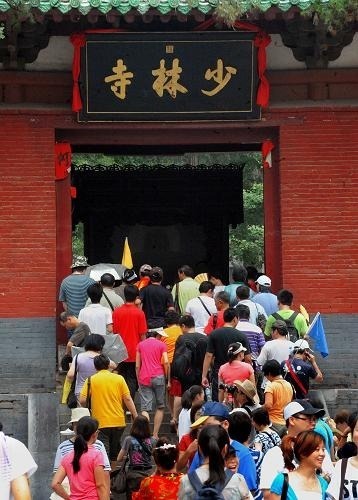 Starting from this year, it seems that the Shaolin Temple has become a culture card of Henan Province. 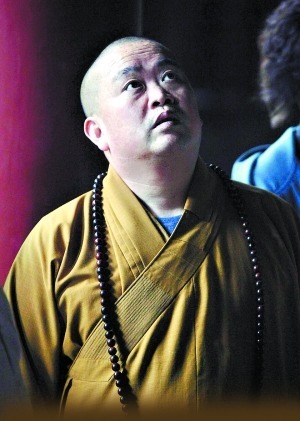 Shaolin Temple invited celebrities each year to join in the “Shaolin Discussion on Zen” activities. In 2006, the Canadian Catholic priest Bob Brown became the first the Catholic to join in this activities. 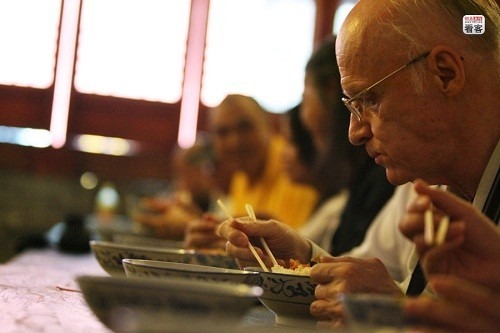 The picture shows September 3 2006, Bob Brown was having meals in its vegetarian dining hall. At the foot of Songshan Mountain the martial arts schools under the name of Shaolin are everywhere. Up to 2009, Dengfeng city has more than 60 martial arts schools with more than 50,000 students, bringing a direct input 5 billion Yuan to Dengfeng City. 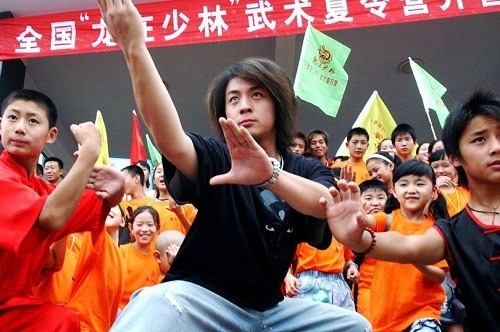 The picture shows July 6, 2005, martial arts star Shi Xiaolong participated in opening ceremony of Kung-fu summer camp. March, 2006. 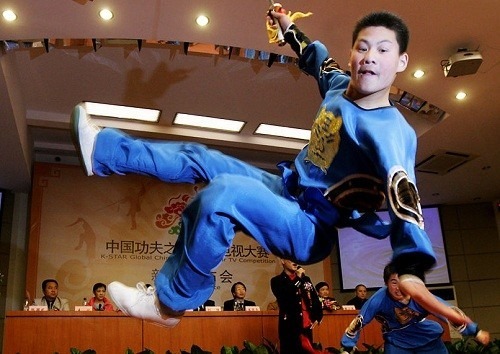 Shaolin temple and a satellite TV station in southern China jointly organized a global Chinese kung fu star competition. Imitating an extremely popular reality TV amateur singing contest called Super Girl, the kung fu contestants relied on the support of mobile short message votes to stay in the competition. Winners of the competition were offered roles in an upcoming movie about Shaolin temple bankrolled by the same organizers behind the TV show. In 2007,In order to promote its “Zen culture” tourism card, the temple produced a outdoor music performance called “Zen Shaolin Music ceremony”. The program was officially operated in 2007, so far the show has been staged nearly a thousand times, attracting over a million tourists. The picture shows 23 May 2007, ten monks opened the light for this ceremony. August 14. 20.06. 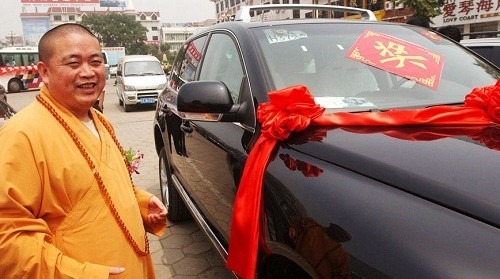 Dengfeng municipality, where the Shaolin Temple is located, awarded the abbot a spectacular luxury sedan in August for his contributions to the local tourism industry. The abbot now drives it everywhere, three-quarters of those surveyed online believe is improper. More than 6 million tourists visited the site in Henan province this year in order to visit its prayer halls and see the temple’s monks perform their kungfu show. 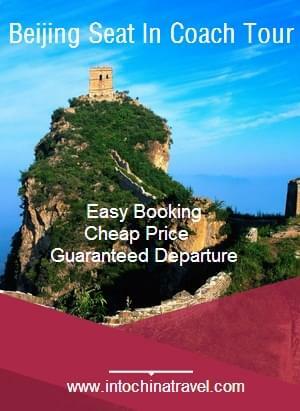 The Shaolin Temple also performs a stage show that has toured London and New York. Shaolin temple is now more like a business. 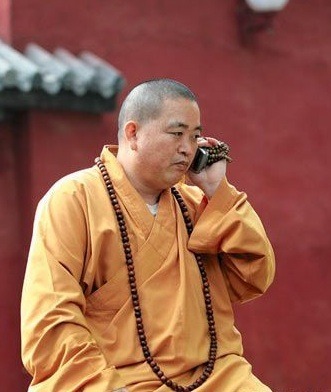 You seldom come across a monk chanting Buddhist sutras. Monks everywhere thumb short messages on their mobiles. The temple’s daily upkeep duties, such as floor sweeping, are all done by hourly workers. Security guards, not monks, guard the temple entrances. 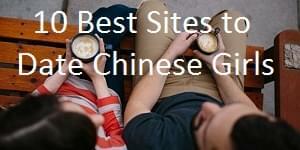 Within the temple, you can find a special liaison office, a temple affairs office and a financial department. It’s just like walking into a CBD office building in Beijing. These contentious moves make the temple and the abbot in particular, the focus of criticism. Those less bothered by the hubbub doubt such moves will disturb the tranquility of the ancient temple. 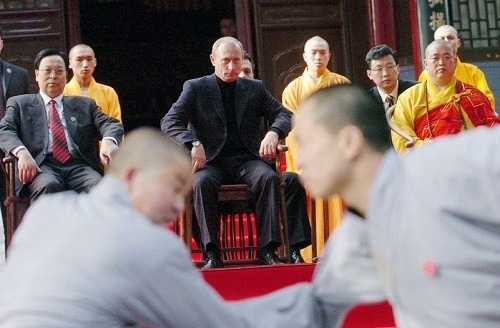 However, extremists deem the Shaolin temple a “moneymaking machine” and the abbot a temple “CEO” stinking of money. The abbot, who has long been used to being called the temple CEO, doesn’t try to shy away from these allegations. He has his reasons for going commercial. 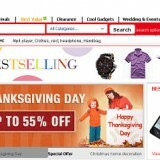 Maybe the Shaolin temple needs some commercial activity to support itself and increase its cultural influence. 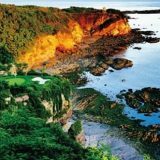 However, the public’s worries are not groundless. After all, Shaolin has been a temple for 1,500 years and it has good reasons to want to remain around for another 1,500 years. 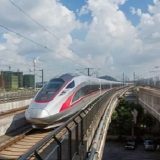 Peter, can you please provide the original Chinese sources for your posts?